Why choose between red and white wine when you can send both? This popular wine duo features two bottles of Château de Valcombe Rhône Valley wines presented in an elegant gift box. It is sure to please any palate. The Château de Valcombe Costières de Nimes Red is a Syrah-Grenache blend with powerful violet and cassis aromas. The wine is harmonious with a fresh finish, offering blackcurrant and blackberry flavors on the palate, with notes of oak and earth. The white wine featured is Château de Valcombe Costières de Nimes Blanc, a lovely dry white Roussanne-Grenache blend. This enjoyable wine has a nose of white flowers and tropical notes and aromas of pears and fresh citrus. Wine duos are favorite gifts in Europe for corporate gifting, birthdays, holidays, and other special occasions. 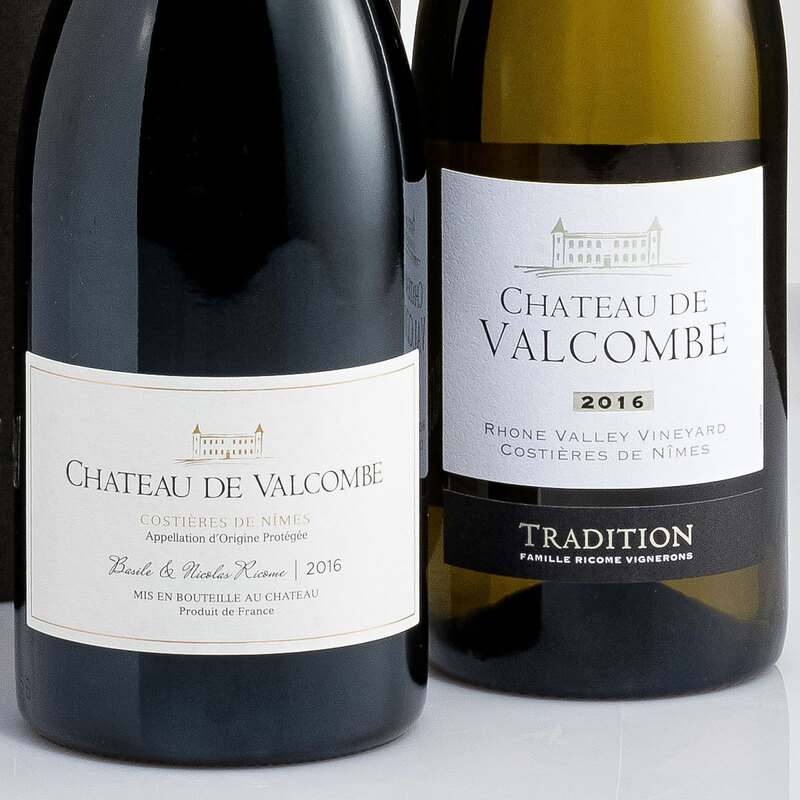 Château de Valcombe Costières de Nimes Blanc is a dry white Roussanne-Grenache blend with a nose of white flowers and tropical notes and aromas of pears and fresh citrus. 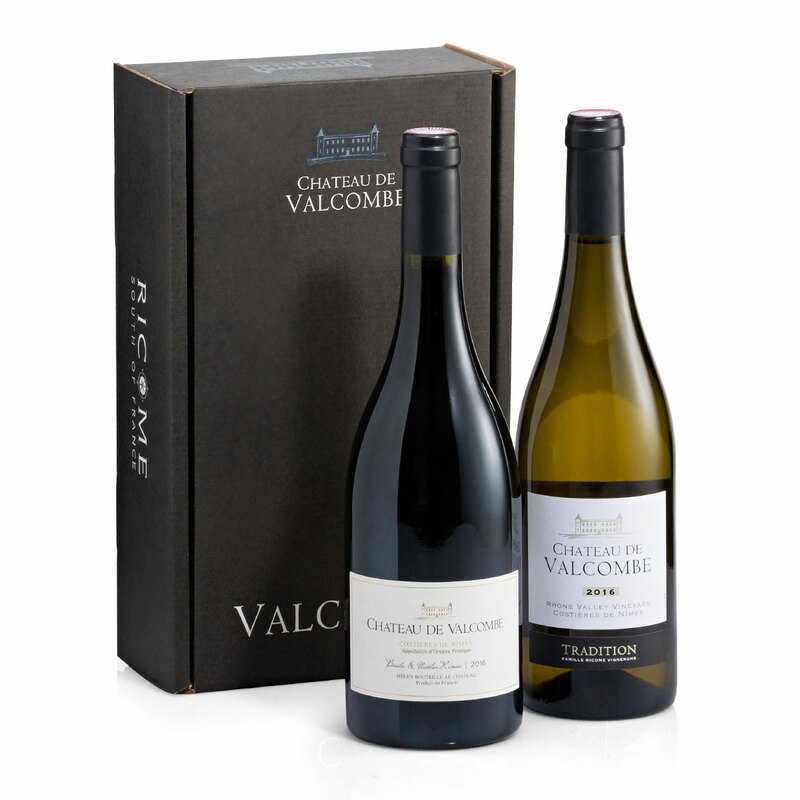 Elegantly presented in a gift box, this pair of Rhône Valley wines is sure to please.